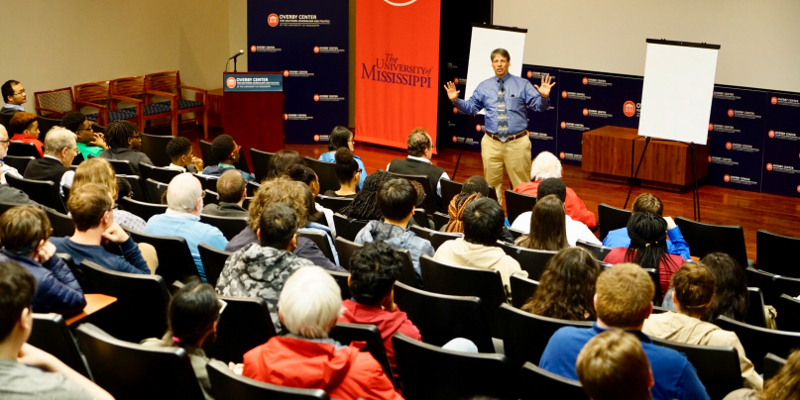 Learn about what it's like to major in Mathematics at the University of Mississippi. 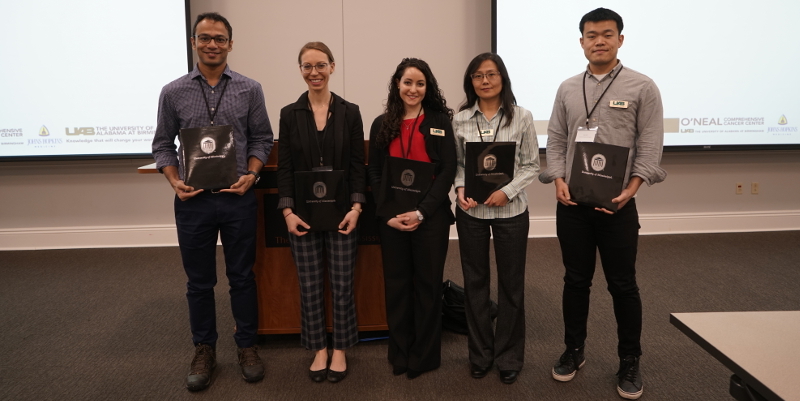 The department hosted the 2018-2019 Alabama-Mississippi Chapter of the American Statistics Association Conference and Annual Meeting on April 5th, 2019. Keynote presentation from Robert Serfling and oral/poster presentations from Ph.D. students attracted more than 70 participants. Robert Serfling delivered the keynote presentation at the 2018-2019 Alabama-Mississippi Chapter of the American Statistics Association Conference and Annual Meeting, organized by the math department and held at UM on April 5th, 2019. 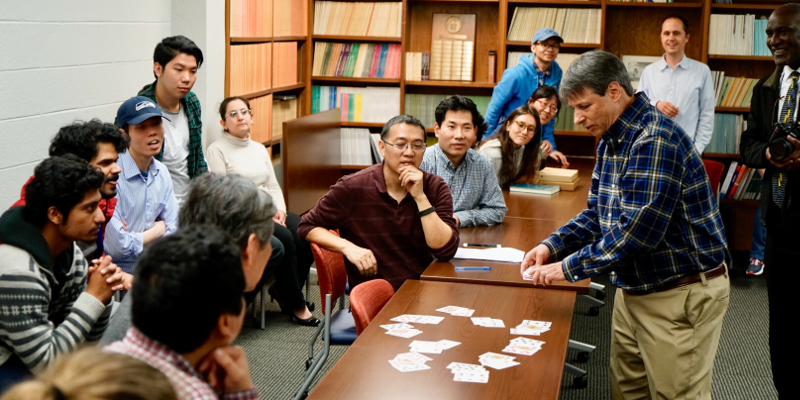 Professor Arthur Benjamin, from Harvey Mudd College, explains to students and faculty members the mathematics behind several card tricks. Saša Kocić, assistant professor of mathematics, has been chosen for funding under NSF’s Established Program to Stimulate Competitive Research, a program designed to help junior investigators in EPSCoR-eligible states develop career-spanning collaborations through extended visits to other premiere research institutions around the nation. 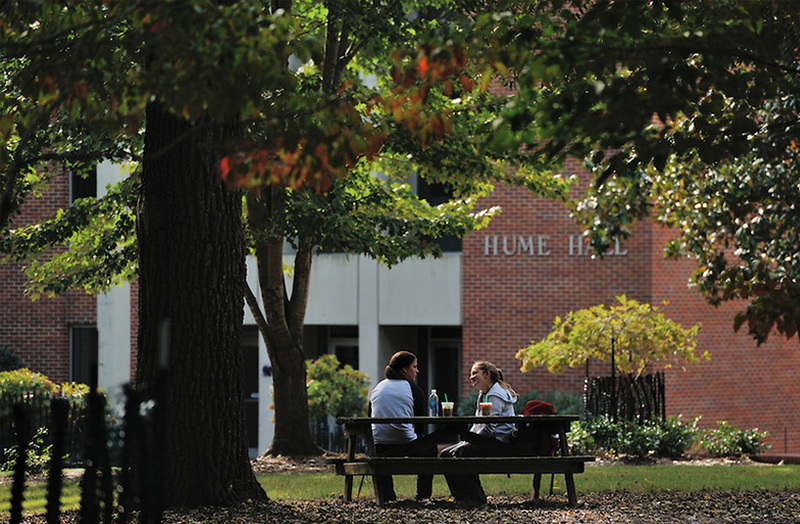 Supported by grants from the UM Office of Global Engagement and the Simons Foundation, Assoc. Prof. Sandra Spiroff traveled to the University of Manitoba to collaborate with Dr. Susan Cooper. Professor Arthur Benjamin, from Harvey Mudd College, delivers the 21st Dalrymple Lecture in Mathematics, demonstrating how to mentally add and multiply numbers faster than a calculator, how to figure out the day of the week of any date in history, and other amazing feats of mind. Math majors Victoria Robinson, Skylyn Irby, and ShaTara Hall attend the 2018 Gulf States Math Alliance Conference in New Orleans, LA, with faculty members Donald Cole and Sandra Spiroff. Our department is part of the Alliance, whose goal is to increase minority representation and mentoring in Ph.D programs around the nation. Also pictured are the faculty and student attendees from Jackson State and Tougaloo. Math majors Dedrick Barkley, Skylyn Irby and Victoria Robinson (second to fourth, left to right) engaged in undergraduate research projects during the summer of 2017 as McNair scholars. Dedrick's research was supervised by Dr. Cole (first left) and Dr. Longla (not pictured); Skylyn and Victoria were supervised by Dr. Derevyagin (far right). 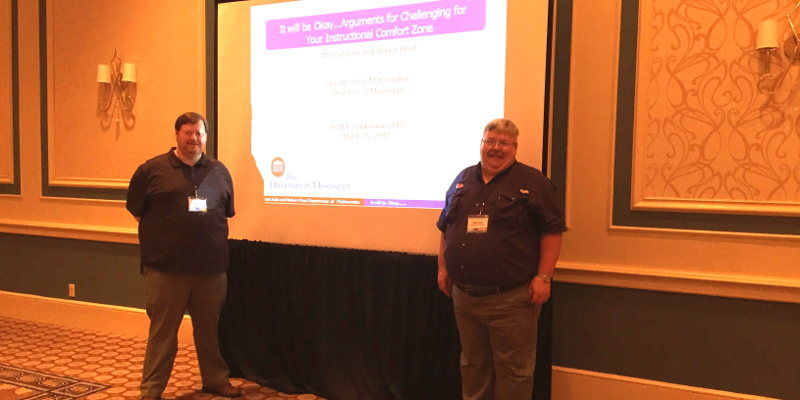 Instructors Robert Hunt and Mike Azlin recently presented on their innovative approach to using technology in mathematics for the second consecutive year at the RTIME Conference in Charleston, SC. 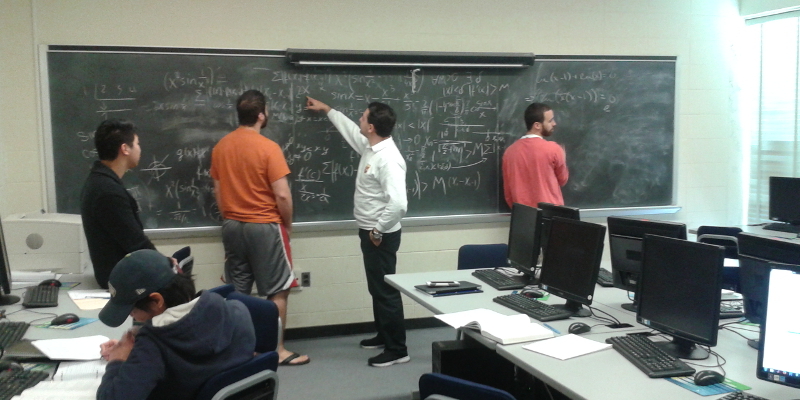 Graduate students discuss homework as well as assist undergraduates with Calculus in the tutoring room. 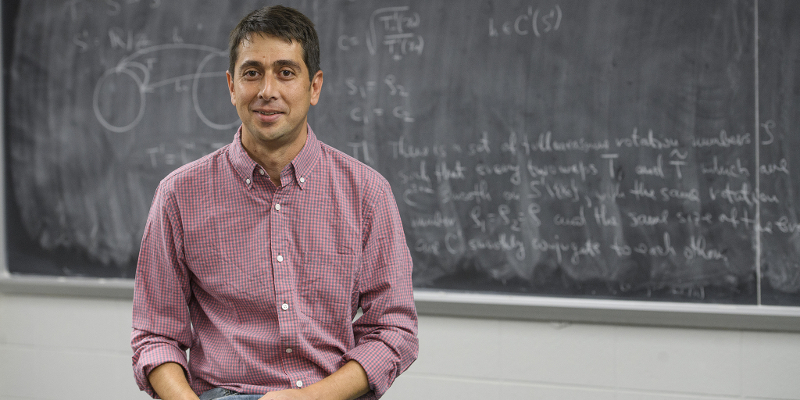 Professor of Mathematics Gerard Buskes has been named the Liberal Arts Outstanding Teacher of the Year. 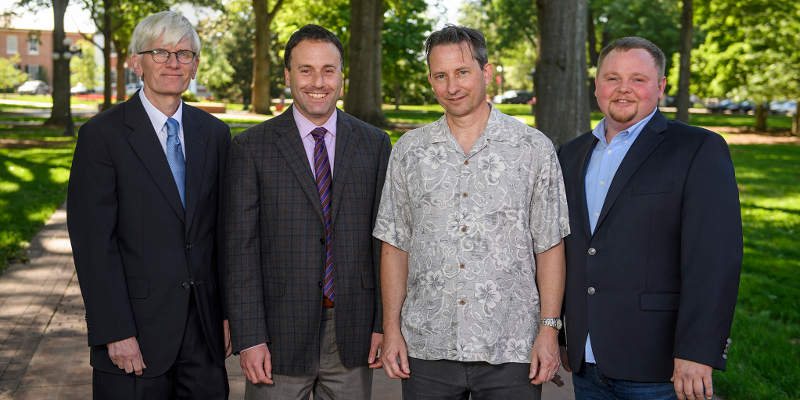 From left to right: Prof. Gerard Buskes, Dean of Liberal Arts Lee Cohen, Prof. Matthew Murray, and Prof. Joshua Brinlee. Professor Arthur Benjamin will deliver the 21st Dalrymple Lecture in Mathematics, on March 1st, 2018, at 7:00 PM, Overby Center Auditorium. Prof. Benjamin is the Smallwood Family Professor of Mathematics at Harvey Mudd College in Claremont, California. He is also a professional magician, and in his entertaining and fast-paced performance, Dr. Benjamin will demonstrate how to mentally add and multiply numbers faster than a calculator, how to figure out the day of the week of any date in history, and other amazing feats of mind. A research proposal of mathematics visiting assistant professor Maksym Derevyagin, Olga Holtz (the lead collaborator, UC Berkeley), and Sergey Khrushchev (Kazakh-British Technical University) has been selected for the Summer Collaborators program at the Institute for Advanced Study at Princeton. The proposal is entitled “The Laguerre-Polya class, Polya frequency sequences and generalized Hurwitz matrices”. The collaboration will take place on the IAS campus in July of 2018. Sandra Spiroff, Associate Professor in Mathematics, will co-organize a workshop at Banff International Research Station October 20-25, 2019. As a collaborative effort with Emily Witt (Kansas), Karen Smith (Michigan), and Irena Swanson (Reed College), the accepted proposal “Women in Commutative Algebra” has the concurrent aims of advancing research and improving the current representation and visibility of women in the field. Saša Kocić, Assistant Professor of Mathematics, has been chosen for funding under NSF’s Established Program to Stimulate Competitive Research, a program designed to help junior investigators in EPSCoR-eligible states develop career-spanning collaborations through extended visits to other premiere research institutions around the nation (full press announcement). This November 4-5, the department will host the 5th Mississippi Discrete Mathematics Workshop. 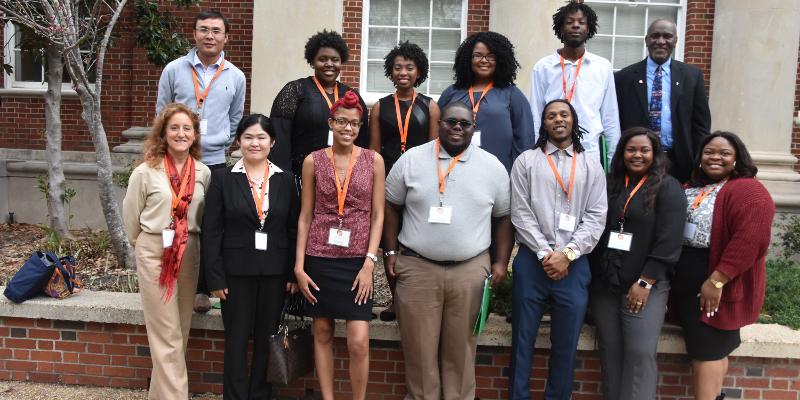 These workshops bring together researchers, graduate students, and undergraduate students from Mississippi and nearby states, as well as a number of international participants. The featured speaker for this year’s workshop is Mark Ellingham, of Vanderbilt University. Further details can be found at http://discretews.math.msstate.edu. We welcome speakers and non-speaking participants alike. Thái Hoàng Lê, Assistant Professor of Mathematics, has been awarded a Ralph E. Powe Junior Faculty Enhancement Award from Oak Ridge Associated Universities. 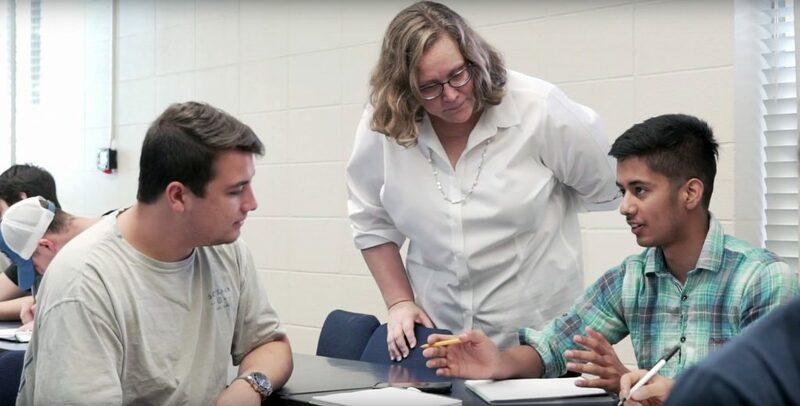 Mathematics major Alex Jane Martin will be inducted into the University of Mississippi 2016-17 Hall of Fame. Alex is a triple-major in Economics, International Relations, and Mathematics. Professor of Mathematics Gerard Buskes has been named the Liberal Arts Outstanding Teacher of the Year, in recognition of his excellence in teaching and dedication to his students.